A nurse conducts a risk assessment on a patient suffering from post-traumatic stress disorder to determine the threat for self-harm or harm to others on a psychiatric hospital unit. Another patient has a bipolar, manic episode. These simulated scenarios mimic a day in the life of nurses and psychiatric patients; only this time the patients are played by Regis acting students, and Regis baccalaureate nursing students work diligently to provide care. The interdisciplinary production is the masterpiece of Associate Professor of Nursing Denise Soccio, DNP, who developed three mental health simulation labs as part of her doctoral thesis (successfully defended on August 11, 2016, to complete her Doctor of Nursing Practice degree). Soccio collaborated with Associate Professor of Theatre Frans Rijnbout, PhD, to bring 50 nursing students and four acting students together for the project. With that in mind, she reached out to Rijnbout to recruit Regis acting students experienced in improvisation. “Although the actors would have case studies and scripts, they needed to have solid improvisational skills to react to a nurse during the scenario in order to drive particular themes,” Rijnbout explains. Soccio put on her director’s hat to prepare student actors to take on the emotional turmoil and angst of mental health patients. One suffered from depression and had hidden a blade in the hospital bed to use for wrist-cutting. Another who was diagnosed with psychosis heard voices (student nurses heard pre-recorded audio with headphones) and threatened safety on the unit. Nursing students put themselves in the shoes of a psychotic patient by "hearing voices" on pre-recorded audio. Nursing students were provided patient demographics and background, reason for admission, and three learning objectives before taking on roles as primary nurse, charge nurse, and medication nurse. During the lab, they conducted patient interviews and risk assessments and determined therapeutic responses to agitated patients while being observed by peers on communication, safety, and delegation. A debriefing session followed. Though acting and nursing are very distinct disciplines, they do share certain commonalities—including improvisation. Empathy is another attribute shared by both actors and nurses. The British Journal of General Practice reported that empathy is linked to lowering patients’ anxiety and distress, and delivering significantly better clinical outcomes (Stewart W. Mercer and William J. Reynolds, 2002). Not surprisingly, patient-centered care is on the rise in the field of healthcare. According to the Institute of Medicine, it is defined as “providing care that is respectful of and responsive to individual patient preferences, needs, and values and ensuring that patient values guide all clinical decisions.” Empathy plays a key role. Market demand for nurses is on the rise, with a projected need for 1.05 million nurses by 2022, according to the Bureau of Labor Statistics. But a 2014 study by the American Association of Colleges of Nursing reported that U.S. nursing schools turned away 78,089 qualified students from baccalaureate and graduate nursing programs in 2013 due to an insufficient number of faculty, clinical sites, classrooms, clinical preceptors, and budget constraints. Inspiration for Soccio’s project came from The National Council of State Boards of Nursing National Simulation Study, which provides evidence that simulation can effectively replace traditional clinical hours up to 50 percent (Hayden et al., 2014). She revised three existing case scenarios and scripts from the University of Maryland and developed two additional ones based on research. The setting: simulated labs—with hospital beds, computers on wheels, and medical equipment—in Regis’ Clinical Resource and Simulation Center in College Hall. 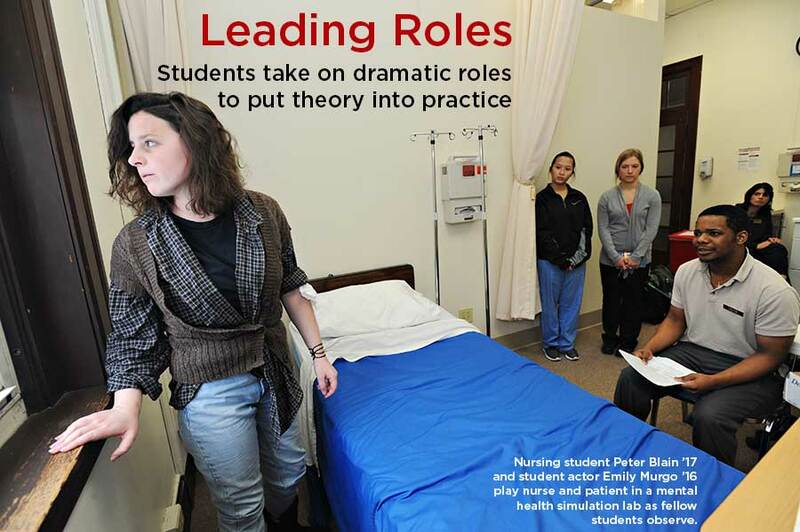 Nursing students report that the simulation helped them prepare for clinicals. The spring program was so successful that Regis has used the model as a best practice for other core nursing classes at Regis—including for 16 part-time nursing students during the summer and for the pediatric/maternity program. 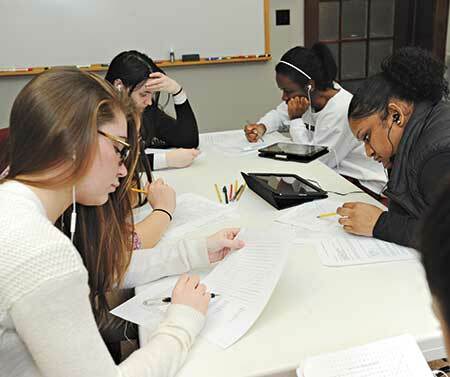 The Clinical Resource and Simulation Center at Regis is a hub of activity for all pre-licensure nursing students. The center, run by lab faculty trained as certified simulation healthcare educators, houses four simulation labs and multiple debriefing rooms. Among the programming: a “clinical boot camp” simulation for beginning nursing students and a multi-patient simulation and focus on prioritization and delegation for graduating students. Simulation scenarios in maternity include a postpartum hemorrhage and a newborn assessment utilizing low-fidelity newborn manikins.